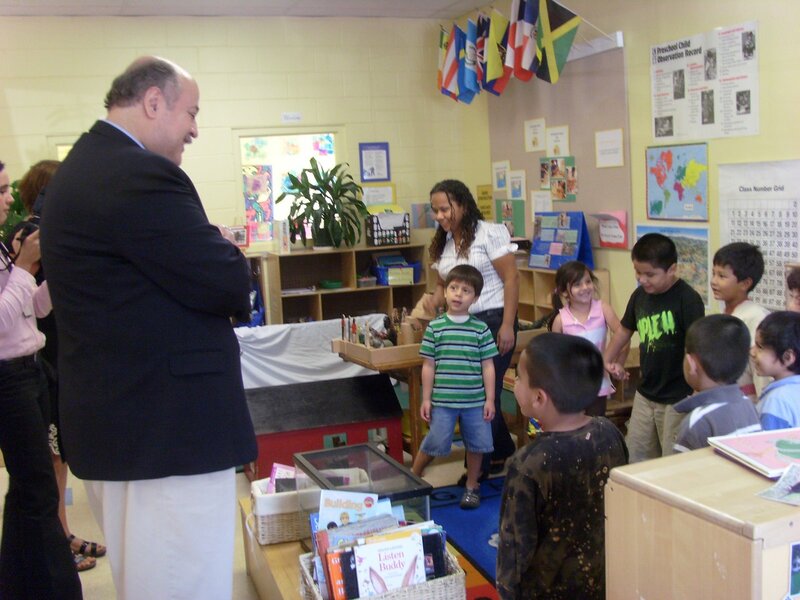 On Wednesday morning, Ambassador Rubén Beltrán, Consul General of Mexico, paid a visit to Anna House. Many of the Anna House families hail from Mexico, and the Consul General came to see for himself the services of the Belmont Child Care Association, and to talk to backstretch families about how the consulate could be of service to them. 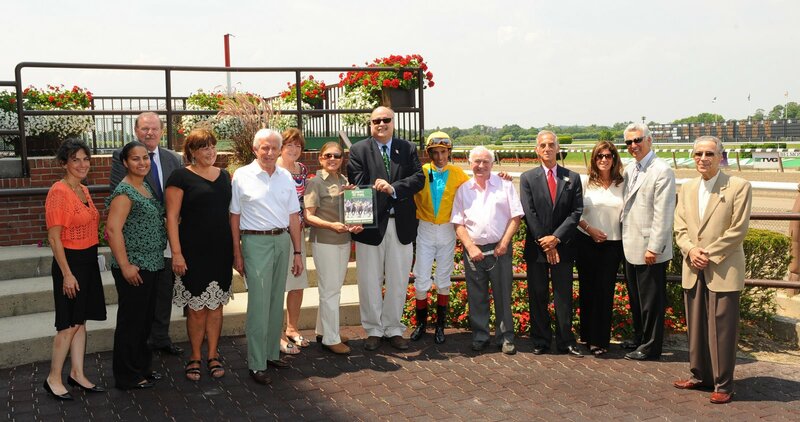 On hand were Donna and Stuart Chenkin, executive and assistant directors of the Belmont Child Care Association; Anna House director Ingrid Gutierriez; BCCA board member Herb Oster; and Jim Gallagher, executive director of New York Thoroughbred Horsemen’s Association and advisory council member of Backstretch Employees Service Team (BEST). The visit began with a tour of Anna House, with stops in several of the classrooms. 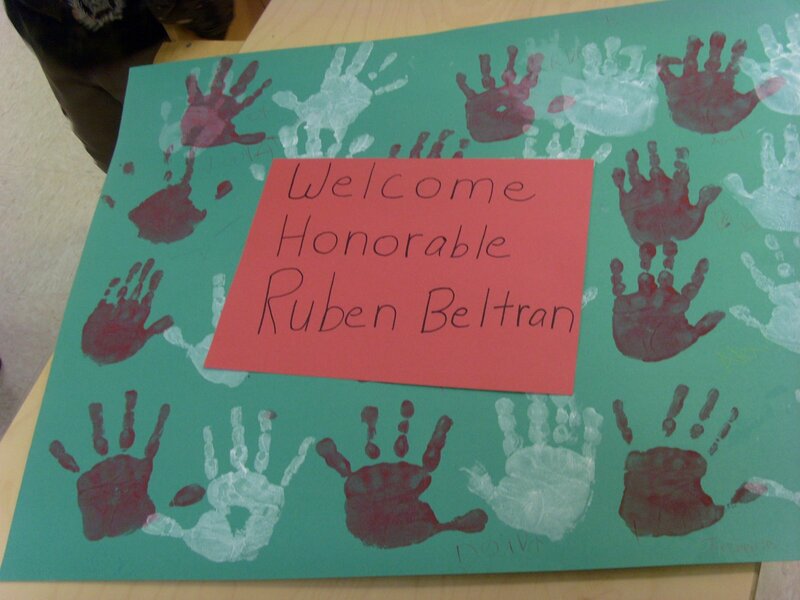 The children were anticipating Mr. Beltrán’s visit; whenever a stranger appeared in the doorway, a child would rush up and ask eagerly, “Are you the visitor?” The pre-school students (ages 4 – 6) sang to him in Spanish, and were loath to let him to leave as they regaled him with stories and peppered him with questions, slipping naturally between Spanish and English. 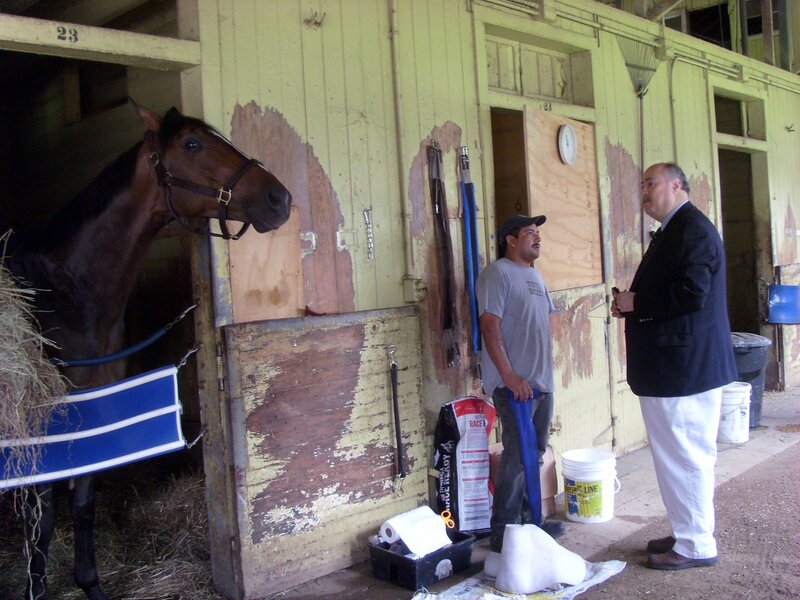 Next stop was the nearby barn of trainer Pastor Mena; as we walked the shedrow, Mr. Beltrán spoke with groom Umberto Hernandez about life on the racetrack. Following our barn visit, we returned to Anna House so that the Consul General could meet with backstretch workers, who had been invited to hear about the consulate’s services and to ask questions. Among the topics discussed were working conditions, health care, and immigration document renewal. In addition to pledging his support where possible, Mr. Beltrán announced that he would donate several collections of books on geography, history, science, and math, along with teachers’ supplementary materials that could be used in the classrooms and library at Anna House. Official business completed, we headed to the races, where we were joined for lunch by Thoroughbred owners Peter and Eloise Canzone and Mexican-born trainer Ramón Hernandez. The Consul General recalled having attended the track in Mexico, but mostly as a social endeavor; he didn’t appear to have placed a bet on those visits, but immediately perused the program and inquired of our party which of the jockeys might be Mexican. 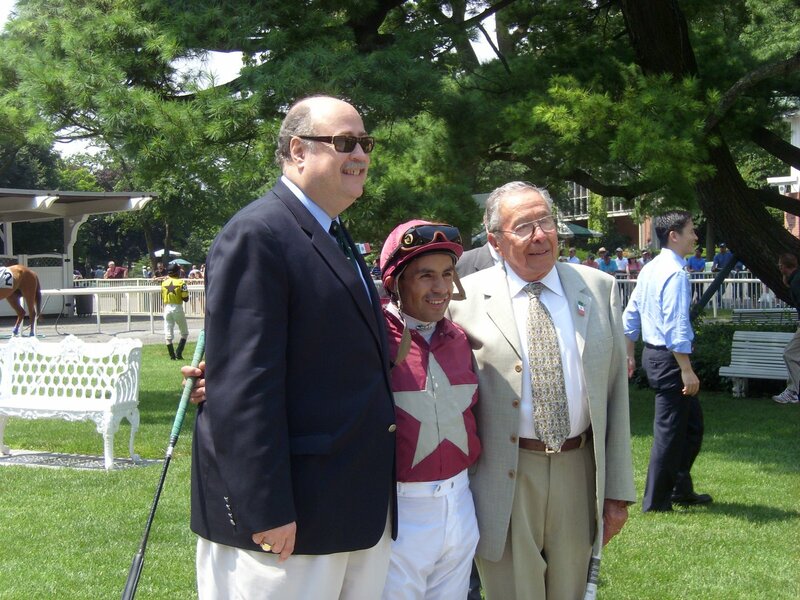 Informed that Jose Espinoza, on the Jimmy Jerkens-trained Queen of Hearts in the second, comes from Mexico, Beltrán made the first bet of his life, and true to racing gods’ form, cashed his first ticket, on a horse that paid $14.20. Not bad for a rookie. The third race of the day was named the Mexican Consulate; Espinoza was in this race, too, on a hefty longshot. Following a trip to the paddock, Beltrán made a pit stop at the windows before heading upstairs to watch the race named in his honor; on the way to the winners’ circle for the presentation, we learned that he had not put his entire faith in his countryman, supplementing his Espinoza bet with some money on the favorite…who happened to win. Two bets, two wins. On the left, Beltrán with Espinoza and Hernandez. With time for just one more race before leaving for another engagement, His Honor declared his betting career over…which lasted, oh, about thirty seconds, until he realized that his fellow Mexican and lunch companion “Mike” Hernandez had a horse in the fourth. Coupled with a John Kimmel trainee, Hernandez’s horse finished fourth…but Kimmel’s finished first. Another bet, another win. Three wins on three bets earns anyone’s respect. Charmed by the children at Anna House, inspired by the backstretch workers, invigorated by the racing, Beltrán is planning a trip to Saratoga to attend the annual Belmont Child Care Association benefit next month. He’ll continue to work to support the Mexican immigrants who do so much to take care of the horses, and with a little encouragement, maybe he’ll hold a handicapping seminar or two? Teresa: Are the backstretch workers earning minimum wage these days? I know the State Dept of Labor announced their findings last summer and it was reported that most trainers were not paying them minimum wages. I sure hope that the barns have done the right thing and are paying these workers a fair wage. Brooklyn Saint, that's a hard question to answer because no one is really paid by the hour. But in general I would say no. BSaint: I don't know for sure; most of the conversation between the backstretch workers and Mr. Beltran was in Spanish, so I understood very little of it. I have seen at least one trainer doing his payroll and talk about complying with labor law after last summer's investigation; I've also heard stories of backstretch workers saying that they are still underpaid. Thanks, Linda!